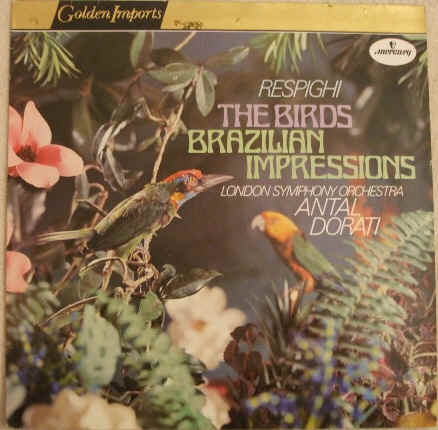 33rpm LP Record of SRI 75023 RESPIGHI THE BIRDS BRAZILIAN IMPRESSIONS, featuring the London Symphony Orchestra conducted by Antal Dorati. It was issued on the stereo Mercury Golden Imports label. Originally released as SR 90153. Made in Holland. The record itself is graded excellent, with no signs of major wear when viewed under normal domestic lighting. Excellent sound quality, with NO jumps, pops, ticks or crackle. Just about faultless. The outer sleeve is graded a bit less than excellent, with light bumping to the corners, rubbing to the top edge and a little loss to the gold colouring on the front cover, while the plain white inner sleeve has no wear to speak of.